The upcoming ONE Fighting Championship (ONE FC) mixed martial arts (MMA) event in Malaysia, Return of Warriors, is less than a month away and most eyes are on these two fighters – Eric “The Natural” Kelly and Pete “Pistol” Davis. Both of them were involved in a busy media tour yesterday to promote the sport, the event and doing interviews. For the first time ever, I was meeting the fighters and visiting the gym, MuayFit, as a media/blogger instead of a student. A little awkward ’cause I haven’t attended any class for like half a year now (ha-ha!) but I managed to throw in a couple of questions that I thought some fans might want to know. Eric Kelly, as most local MMA fan already know, is an undefeated Filipino fighter (9-0) who trains here in Malaysia and will be competing in the main event – the first ever ONE FC Featherweight World Championship Title Fight. He’s highly respected in the scene and is regarded by many as a rare world class MMA fighter from South East Asia. His opponent is none other than his fellow countryman and friend, Honorio “The Rock” Banario, who’s coming into this fight with a record of 7 wins and only 1 loss. Before they performed a short MMA demo for the bloggers yesterday night, we actually had a quick dinner session with Peter Davis. Although Pete has to cut 10kgs for his lightweight bout against Leo Krishna, he seemed pretty casual with his meal yesterday. With confidence, he said to me, “Don’t worry, I’ll make it.” He’ll be one of the fighters that will be representing home crowd at ONE FC: Return of Warriors. I’ve known Pete as an actor first when I watched the local film Sell Out. Few years later, I was surprised to find out that he’s also a MMA instructor when I saw him judging the fights at Mayhem 2 (I wasn’t a MMA fan yet that time). I joined MuayFit as student and learnt more about MMA from his classes there on the weekends. Pete’s a full-time model and an actor but the only time I’ve seen him on big screen was in Sell Out. I’m sure I wasn’t the only one curious so I asked if he’ll be acting in a full-length movie ever again and he said that his upcoming martial art-action-romance film project is currently looking for investment. “Do you have 800 thousand?” he jokingly asked. “We already have 250 thousand in the bank and we’re still in the process of getting the amount we need.” He also shared that the movie is not independent and its working title is Wuji or Without Limits. When asked about his MMA career goal, he said he’ll try to win this fight convincingly and get a title shot but if he loses, he’ll probably “pack his bags”. It’s not the first time he said that but I haven’t seen him lose any fight yet. After the impressive TKO win in his previous fight, the locals will be expecting nothing short of another spectacular performance. As a huge fan and a (former) student, I wish both of Eric and Pete all the best. I’ll definitely be cheering for them at Stadium Putra on February 2nd 2013. Tickets of this event are selling fast on AirAsiaRedTix.com so grab ’em quick! 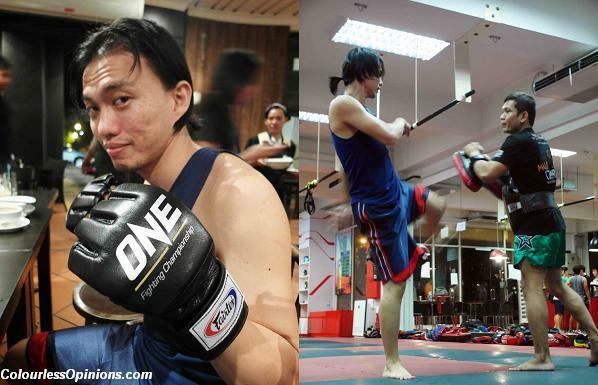 I’m all pumped up for ONE FC: Return of Warriors! Oooo.. Ethan and Daddy wud love this!! Hope Pete Davis gets a big win!